When’s the last time you measured out half a cup of ice cream, ate exactly 15 chips, or leveled out two tablespoons of peanut butter? You may be surprised about what a serving of these common foods actually looks like. While using measuring utensils and counting calories isn’t necessary to maintain a healthy diet, it doesn’t hurt to be aware of the recommended serving sizes for the foods you’re eating on a daily basis, particularly if they’re calorie dense. Below are some visual representations to think about the next time you reach for a pint of ice cream, a bag of trail mix, or a jar of peanut butter. *This means that there are 4 servings per pint! Did any of these surprise you? It’s unnecessary to obsess over exact measurements, but being mindful of your portions can help you reach your health goals. As you can see, many “healthy” foods are higher in calories, fat, and/or sugar than you may think. Furthermore, eating smaller portions leaves room for a larger variety of foods within your daily intake, which can help you reach your macro- and micro- nutrient requirements. 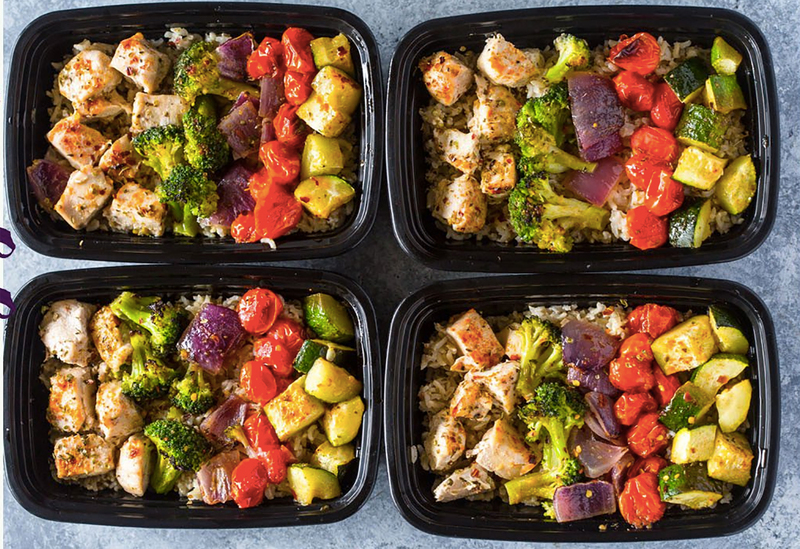 Meal prepping can be very practical and beneficial, especially when you are in a rush and don’t have time to be cooking every time you go home. By meal prepping you can avoid the temptation of buying fast food or low-nutrient snacks and stop compulsive eating behaviors when you’re hungry. In addition, it’s easier to control the number of portions you eat, and therefore, to control the number of calories you consume as well. Try to include a variety of foods such as protein, whole grain, vegetables, fruits, and fats with all your meals in order to feel satisfied. Don’t forget to vary the texture, color and flavors to make your meals more appealing and delicious. Also, leftovers can be a great way to save up time and to avoid wasting food. Plan ahead. Before you even go to the grocery store to buy food, make a list of the ingredients that you are going to use in your meals. Make an estimation on how much money you are willing to spend at the beginning or end of each week and make a plan. That way when you go to the store you won’t be wasting time deciding and will know exactly what to get. Choose a day to cook. Choose a day during the week when you are not very busy and dedicate a couple hours to cook. Most people find it easier on the weekends because they have more time to go grocery shopping and to plan their meals, but it can be whatever day is easier to you. Make a big batch. In order to save time during the week, you can cook big batches of food and freeze them. You can place your meals in tupperware/containers to make it more convenient and on-the-go. Be creative. Try to use different ingredients and add color to your meals. This is a good opportunity to get out of your comfort zone and to try new things. You can challenge yourself each week to make it more interesting. For example, you can try cooking only plant-based meals or to only cook with seasonal fruits and veggies. Check We Love Clean Food and Meal Prep Mondays for some inspiration! Does Eating really fix the problem? Why do we eat? Besides the obvious reason that we need fuel to keep us healthy and moving, we eat because food is yummy. There’s a form of happiness that comes from eating a warm, fudgy brownie. Eating is also important during celebrations, reunions, or simply hanging out. With so much cultural diversity in this town, there are so many food choices available that make it that much harder to find an excuse to not go eat. However, there’s another reason why some of us eat. We refer to it as ‘snacking’ but sometimes it is a coping mechanism – then it is stress or emotional eating. We relate ‘Food’ to ‘pleasure’. At the end of a tiring, long day what is one thing you can look forward to? A plate of fries or maybe a bowl of ice cream? Both can give you a temporary feeling of happiness, and if you’re like me, those types of comfort food are often associated with feelings of bliss, at least at first. But, instead of associating food that sense of pleasure and then suffering the consequences of too much junk, not enough nutrients, or just eating more food than you need, try using different activities to accomplish the bliss goal. What about that painting class you always wanted to take or learning how to play the guitar to serenade your cat and enjoy some music when you arrive home after a hard day? This will feel especially doable if you’ve been practicing good, adequate eating habits throughout your day and are not famished! Having other activities besides eating to look forward to can cause you feel that same bliss. To avoid difficult situations and/or feelings. During time of hardships and challenges, for many of us – including myself, we tend to avoid feelings. Avoiding feelings makes us more likely to seek out temporary fixes such as eating that feel good during the moment, but are very temporary, in fact may make things worse. One important fact to remember is that it’s okay to feel sad, mad, and frustrated. If it wasn’t for these feelings, would we know what happiness really is? Learning how to talk about your feelings, whether it be in the form of journaling, calling a hotline, or talking to a friend, can help you realize the deeper rooted problem that is causing you to want to turn to food for comfort. One thing I’ve learned from my 2 ½ years of college so far is that there are days where I can be swamped with work, class, assignments, studying, you get the idea, right? If I don’t take the time to feed myself, lovingly throughout the day, I find myself more irritable and more susceptible to my cravings/eating more junk food because I’m “hangry” when I finally get home. Having a regular and nutritious meal schedule is important to staying healthy and lessening the likelihood of emotional eating. Society has led most to believe that beautiful means thin and skinny, with flat tummies. Our lives are filled with some of the most innovative and connected technology, it can be hard to avoid societal influences of what beauty is. In reality, beauty is something that cannot be defined, at least not by society. Beauty is more than just appearances. It can be seen through the actions of taking care of yourself, being true to who you are, being kind to friends, family, and strangers, taking care of the earth, and the list could go on. If taking care of yourself means indulging in some sweets once in a while, that’s perfectly fine. Just remember that eating as a temporary fix for whatever challenge you may be facing is okay, but it’s important to remember that addressing the problem can pave the way to a more permanent solution. Vitamins are a group of organic compounds with regulatory functions. Vitamins cannot be synthesized in sufficient quantities by the body; therefore we must obtain them in adequate amounts from food. There are 13 universally recognized vitamins: 9 water-soluble vitamins and 4 fat-soluble vitamins. Water-soluble vitamins are not stored in body (except Vitamin B12), and mostly are non-toxic when we intake them excessively. On the contrary, fat-soluble vitamins can be stored in body, and most of them are toxic at excessive doses. Generally it is not recommended for people without malabsorption issues to take vitamin supplements, because we can get enough through a healthy diet! While every vitamin is essential,today our emphasis is on vitamins that are beneficial to college students. Vitamin D is a fat-soluble vitamin and has many functions that help people stay healthy. Vitamin D can be synthesized in the skin from the sun, and helps the body absorb calcium. Along with calcium, vitamin D helps to keep our bones healthy and strong. Vitamin D also plays an important role in our immune system, which protects us from illness and infections. Good food sources of vitamin D include: liver, beef, veal, eggs, dairy, some saltwater fish, and foods fortified with vitamin D. College students have large amounts of physical activities, so intaking enough vitamin D can help students have healthy bones to do daily activities. Vitamin A is another fat-soluble vitamin, and it is stored in the liver. Vitamin A is important for maintaining healthy eyes, keeping the immune system strong and helping cells function properly. There two forms of vitamin A: retinoids and provitamin A, also known as carotenoids. Retinoids are found in animal products such as liver, dairy, eggs, fish oils, tuna, and sardines. Carotenoids are found in plant-based foods, such as fruits and vegetables that are bright colors to yellow, orange and red. Since we have stressful academic works everyday, it is really important to take adequate vitamin A to protect our vision. B vitamins include a group of 8 water-soluble vitamins called the vitamin B-complex. Vitamin B-complex has a very important role in energy releasing. One or more B vitamins are involved in every aspect of catabolic process, and provide energy to us by breaking down molecules through process. Vitamin B12 is one of the most important vitamins in this process. Vitamin B12 also has functions in the brain and nervous system, and for the formation of blood. Good food sources of vitamin B12 are meat and dairy products. We also can choose foods that are fortified with vitamin B12. All 13 vitamins are essential for our health, so it is important to follow the “My Plate” template and choose a wide range of foods to get enough vitamins, as long as they are not in any serious diseases or conditions. It’s a little over a week into 2018: a perfect time to reflect on the successes and struggles of those pesky New Year’s resolutions we all seem to make. For those of you that have stuck to your goal of going to the gym more often, or eating more leafy greens, congratulations! Research has shown it takes 21 days to make something a habit, so you’re halfway there! For those of you that haven’t been so successful, you’re absolutely not alone. New Year’s resolutions are tough. For one, there are a lot of expectations and hype surrounding becoming a newer, better version of yourself, al starting on January 1st (or the 2nd if that NYE party was a real rager); however, in reality, time is relative. There’s no difference between starting a new habit on January 1st or June 1st, other than those 6 months. Granted you live for at least 20 more years (here’s hoping), 6 months is a pretty small fraction. What I’m trying to say is that January 1st isn’t the end-all-be-all for changing your life for the better. If you aren’t able to stick to your first resolution for whatever reason, whether it be that it’s too expensive, too time-consuming or just too difficult to keep up, that’s okay. You don’t have to abandon the resolution; just modify it. When an engineer designs a building but it gets painted the wrong color, they don’t tear down the whole building. They just repaint it. A good New Year’s resolution, or any lifestyle change for that matter, needs to be something you can see yourself being able to continue for the rest, or most, of your life. For example, I know I cannot completely cut out desert forever (have you ever had ice cream?) but what I could do is cut down on my portion size, or only have it a couple times a week instead of every night. Additionally as a student, working out every day at 7am isn’t exactly sustainable, but working out after class 3 or 4 times a week could be. If down the line you find yourself suddenly hating ice cream, or craving more workouts, you can definitely switch some things up, but in the beginning, its best to start small with more attainable goals. So what is a good way to assess an attainable, smart goal? Well, there’s a convenient acronym for that. It’s called SMART: Specific, measurable, attainable, relevant and timely. Specific refers to a clear definition of the goal, such as “I will take a 30-minute walk in the morning, 3 times a week” versus just, “I will get in shape.” Measurable means having a way to evaluate how thoroughly the goal has been met, such as marking exercise days on a calendar or keeping a food journal. Achievable means the goal must be within the realm of possibility; for example, “I will lose 1 pound a week” instead of, “I will lose 20 pounds this month.” Talking to a professional like a doctor, dietitian, or personal trainer can help to navigate how achievable a health-related goal is. Relevant refers to how much the goal fits in with your lifestyle and other pursuits. For example, while in school, a resolution such as “I will learn how to swim” may be more relevant than “I will learn how to scuba dive.” Lastly, timely means that the goal should have some defined checkpoint or endpoint, such as “I will eventually be able to meditate for 20 minutes by adding 5 minutes to my meditation every 2 weeks.” Of course, from there you can decide to modify the goal. And finally… Think about where you were 3 months ago. If you had made just a small lifestyle change then, today could a very different day. With time flying by the way that it does, who knows where you could be in just a few months by taking a small step towards a healthier future, today. 1. Sauté peeled and thinly sliced Japanese eggplant in olive oil; reserve. 2. In the same skillet cook thinly sliced onions. Deglaze with honey and vinegar. Add tomato sauce and reserved eggplant. Simmer for 10 minutes, let cool. 3. 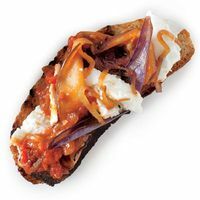 Spoon onto baguette slices and place mozzarella slice on top. Sprinkle with salt and pepper. 1. Preheat oven to 400 F. Spray a baking sheet with olive oil. 2. Toss the squash with the olive oil and salt and spread in a single layer on the baking sheet. Roast for about 20 min, or until tender, tossing after 10 min. 3. While squash is roasting, prepare the quinoa according to the package. 4. In a bowl, combine the squash, quinoa, and remaining ingredients. Sprinkle goat cheese on top.